you will not again undergo birth and decay. 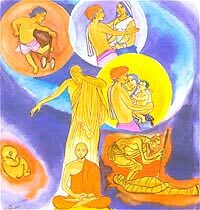 to attachment to the past, future and present Khandha aggregates. existences (i.e., Nibbana); an arahat. stop him from marrying her. He married the young dancer and followed the troupe. their attention to him instead of applauding Uggasena for his acrobatic feats.